The other morning I found myself drooling while I worked out as Lorraine Pascale made her Swiss Roll Bowl Cake. It looked so insanely easy and yet such a work of genius at the same time, I decided there and then I had to make it. My kids would love it, and I only need have the tiniest sliver. What’s more it’s frozen, so it’ll be around for a while. Plenty of time to have a few tiny slivers. On non 5:2 fast days, of course. All you do is line a bowl with slices of chocolate Swiss roll, soak in a little alcohol if you wish, and then fill with lots of your favourite ice cream. Then bung in the freezer and Bob’s your uncle, one incredible frozen cakey masterpiece. You should have seen my children’s faces when I brought this to the table. I really wish I’d got a photo. I reckon this would make a great child-friendly dessert during the festive season, and an ideal alternative to rich Christmas pudding or cake, without losing any of the oomph. Carefully line a 2-litre glass bowl with cling film. Slice the Swiss roll into slices, roughly 1cm thick. Lay the slices inside the bowl, covering the bottom and sides. Tear up pieces of the leftover cake to fill in any holes. Drizzle a splash of rum, brandy or apple juice over the Swiss roll. Cover with cling film and place in the freezer for about half an hour. Spoon your chosen ice cream into the cake bowl. If you’re not using a soft scoop ice cream, it helps if you remove the ice cream from the freezer for 10 minutes or so beforehand to give it a chance to soften a little, but don’t let it melt completely. Cover with cling film again and freeze again for an hour. When you’re ready to serve, remove the cling film and place a plate on top. Carefully turn the bowl over onto the plate and the cake should come free. If not, warm the bowl a little with your hands. Slice into wedges and tuck right in. 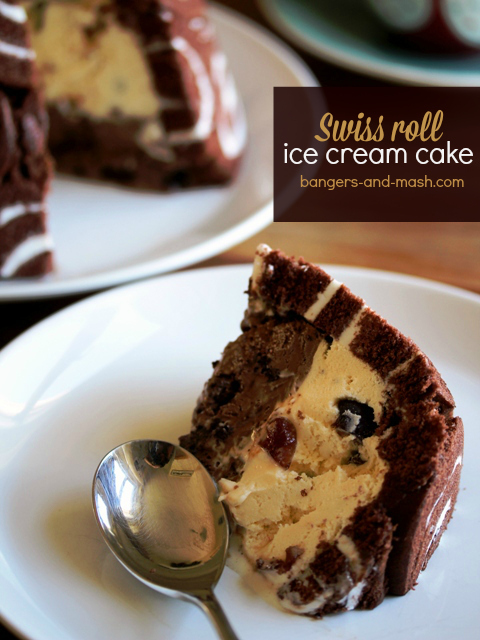 This Swiss roll ice cream cake is my entry into December’s Family Foodies challenge, which I co-host with Louisa over at Eat Your Veg. 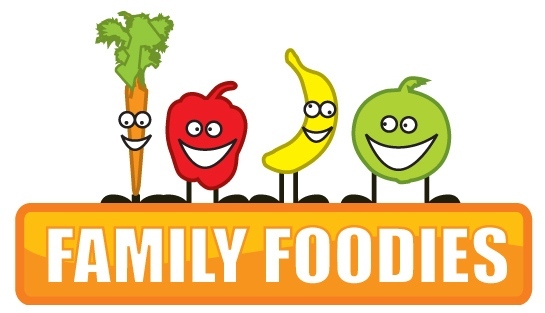 The theme this month is Festive Family Food. 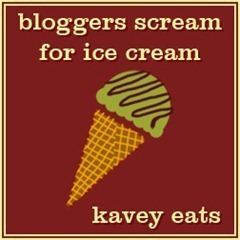 I’m also entering it into this month’s Bloggers Scream For Ice Cream hosted by Kavey Eats, where the theme is Ice Cream Showstoppers. From my kids’ reaction, I’d say my Swiss Roll Ice Cream Cake fits the bill nicely. I kniw, they’ll be just like Cuckoo clocks (ie not Swiss!). Ha! I love ice cream cake like this. I always used to ask for a version made with trifle sponges and covered in a light meringue for Christmas when I was a kid! I can totally appreciate your kids excitement!! I’ve been toying with the idea of getting up earlier to exercise too. I’ve been doing it after the kids go to school and by the time I’m done and showered it’s 11am and half the work day is gone! Lovely sounding pudding though – I don’t think I’d be able to stop at just one bowlful! This looks so amazing!!! These cakes are the ones that I like the most, I’ll have to use your recipe! Definitely a showstopper, and I am ALWAYS a fan of maximum deliciousness and impact for minimum time slaving in the kitchen, so love the idea of using shop-bought swiss roll and ice cream. Looks really rather magnificent!